Silver Spring, MD, USA… [IRLA news]. 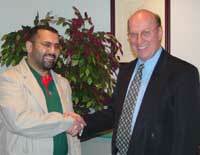 “Either you are for religious liberty and human rights, or you are not,” said Imam Ilgar Allahverdiyev, president of the International Religious Liberty Association’s (IRLA) affiliate organization in Azerbaijan, during his visit to the IRLA headquarters office on June 24, 2003. “When you have religious liberty, you have human rights. Democracy in any society depends on religious liberty,” he added. Imam Allahverdiyev has been involved in a wide range of various causes including a program called Motherland Without Orphans, initiated in 2002 to help change the situation for homeless children; Struggle Against Alcoholism and Drugs, an organization working to combat citizen’s struggle with substance abuse; Dar-Ul-Hikmet, a science and research debate center focusing on issues such as “Islam, the Religion of Tolerance,” “Dialogue of Civilizations,” “Islam and Hygiene,” and many others. The IRLA affiliate in Azerbaijan was formed on September 20, 2002, with a variety of religious groups represented in its officer group. The IRLA was first organized in the U.S. by members of the Adventist Church and chartered in 1893, but is non-sectarian and promote principles of religious freedom for all people everywhere. Bordering the Caspian Sea, between Iran and Russia, Azerbaijan’s population of over 7 million consists of only about three percent claiming affiliation with a Christian church. Azerbaijan’s constitution upholds the right of all people to choose and practice their religion.